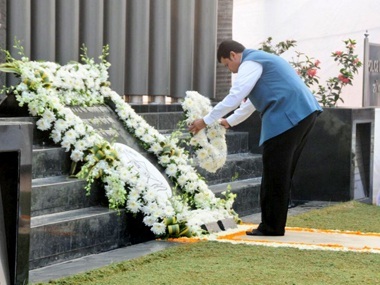 Mumbai: Maharashtra Chief Minister Devendra Fadnavis paid homage to the martyrs of Mumbai terror attacks on the seventh anniversary of 26/11 terror attacks which shook the nation few years ago. As a mark of respect to the martyrs who laid down their lives while fighting terrorists who had attacked the city on this day seven years ago, CM paid floral tributes to the force personnel. He was joined by other dignitaries while he offered his floral tribute to the martyrs at the police memorial site at the Mumbai Police Gymkhana in south Mumbai. Maharashtra Director General of Police Praveen Dixit and Mumbai Police Commissioner Ahmed Javed also paid their homage paid and tributes to the martyrs at the 26/11 memorial. Dixit said, ‘We re-dedicate ourselves for the noble values including freedom enshrined in the Indian Constitution today on 26 November, 1949.’ Family members of the policemen, who lost their lives during the November 2008 attacks, were also present during the ceremony. Congress did its bit when, to mark the seventh anniversary, Mumbai Congress president and a local municipal corporator named a square after home guards officer, Mukesh Jadhav, who fell to a terrorist’s bullet near St. George Hospital on 26/11. Jadhav, 23, was on patrol duty between the main and local railway lines at CST when he suddenly came face-to-face with one of the terrorists who shot him in the chest. An injured Jadhav, despite being shot, had stumbled to inform the police about the attacks which resulted in saving lives of hundreds of unaware commuters. The city too paid its homage to the ghastly attack victims, by taking out a walk for peace on Wednesday evening, as part of the Global Peace Initiative, in which celebrities joined a Walk For Peace along with children in central Mumbai and paid homage to the heroes and victims of the 26/11 attacks. On November 26, 2008, 10 Pakistani terrorists arrived by sea route and opened fire indiscriminately at people killing 166, including 18 security personnel, and injuring several others, besides damaging property worth crores. The then ATS chief Hemant Karkare, Army Major Sandeep Unnikrishnan, Mumbai’s Additional Police Commissioner Ashok Kamte and Senior Police Inspector Vijay Salaskar were among those killed in the attack. The attack had begun on 26 November and lasted until 29 November. Chhatrapati Shivaji Terminus, the Oberoi Trident, the Taj Mahal Palace & Tower, Leopold Cafe, Cama Hospital and the Nariman House Jewish community centre were some of the places targeted by the terrorists. Ajmal Kasab was the only terrorist who was captured alive. He was hanged four years later on 21 November, 2012.